A recent conversation with a friend whose father has advanced dry macular degeneration reminded me that there are still many people who are unaware of the telescopic retinal CentraSight Implant. Research for the implantable device began in 2006 at 28 eye centers in the United States. Well known eye centers like Wilmer Ophthalmological Institute in Baltimore, Maryland and Emory Eye Center in Atlanta were some of the study sites. 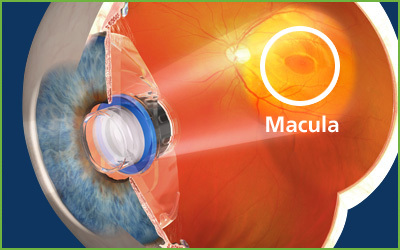 This macular implant has been available since the summer of 2012. It is FDA approved and is becoming more and more accessible as new ophthalmic surgeons are being trained in the implant procedure. "In a 219-patient, multi-center clinical study of the Implantable Macular Degeneration Telescope, 90 percent of patients achieved at least a 2-line gain in either their distance or best-corrected visual acuity, and 75 percent of patients improved their level of vision from severe or profound impairment to moderate impairment." There are requirements to see if someone would benefit from the implant. However a recent change in the age criteria means that the CentraSight implant will be available to more people with macular degeneration than it was before. "While the CentraSight treatment program does not represent a cure for End-Stage AMD, the telescope implant has been shown in clinical trials to improve vision and quality of life of some (or majority of or equivalent) patients with End-Stage AMD based on a questionnaire developed by the National Eye Institute."